Bollywood actor Rishi Kapoor may have given a miss to his son Ranbir Kapoor and Katrina Kaif organized Kapoor family dinner date but he was seen spearheading a morcha against the BMC's proposed hawking zones in Mumbai’s posh Pali Hill area in Bandra, where many film stars reside. 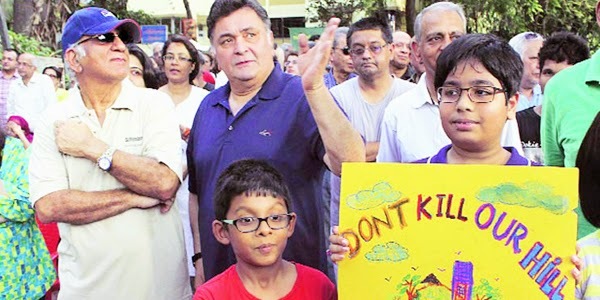 According to reports Pali Hill Residents, led by actor Rishi Kapoor, hit the streets on Sunday to protest the civic body's move after a hawking zone has been demarcate right outside Rishi Kapoor’s bungalow as per the Mumbai’s new Development Plan (DP). Joining the morcha were eminent Bollywood celebrities like famed villain Prem Chopra, fashion designer Manish Malhotra, composer-singer Vishal Dadlani, filmmaker Rakyesh Omprakash Mehra and actor Emraan Hashmi etc.